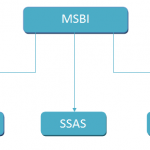 SSAS stands for an SQL Server 2008R2 Analysis Services. The Microsoft Business Intelligence (BI) suite provides quiet a powerful technology-“SQL Server Analysis Services (SSAS) to offer online Analytical Processing (OLAP) and data mining for the applications of business intelligence. The purpose of analysis services is to convert the data into information and to offer a fast and simple access to that information for taking decisions. 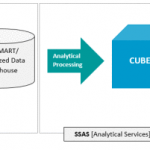 SSAS presents OLAP by enabling to design, create and handle multidimensional structures which consist of data aggregated from the other data sources, such as relational database and provides in numerous data mining algorithms for mining data from sources. So for delivering OLAP and data mining it makes use of client and server technologies. The most important thought of SSAS is to offer quick results from data sources when applied a query so as to make a decision, the data of different dimensions is needed. OLAP performs this by pre-calculating and storing the aggregates. This needs much disk space, but here it offers the capability to explore the data promptly as the data is already processed. Why: The most used database is a relational database. In a relational database, data is stored and the data can be fetched by applying the queries, generating reports etc. But here if queries and reports are kept in mind the data of certain things can be accessed. But by using analysis data can be played with or slicing and dicing can be done with the data with the minimal efforts. The main thing about this is that the power of analysis of data is provided to anyone who is not a DBA or a database professional or developer. 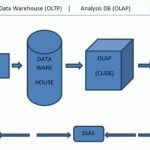 How: This is a very important question, how analysis services can be used for OLAP and Data mining. It is quite easy to work on analysis services, and challenging by itself. The server component is executed as a Microsoft windows service. SSAS supports multi-instance on a single computer, so every instance is executed as a separate instance of a Windows service. Clients interact with the analysis services through XMLA (XML for Analysis) a protocol which is an SOAP-based is used for issuing commands and getting responses, is shown as a web service. SQL: It is a structured query language, mostly used. 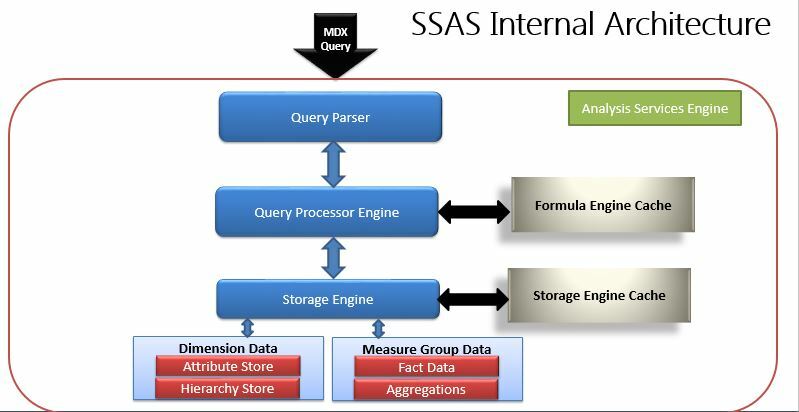 MDX: MDX is a Multidimensional Expression a query language used in retrieving multidimensional data from SSAS. MDX is based on the specifications of XMLA. DMX: is a Data Mining Extensions language works in collaboration with data mining models. DMX can be used to create a new structure of data mini models, to train the models, to browse and handle and forecast against them. AASL (Analysis Services Scripting Language): Most communications of SSAS client happens with SOAP messages. AASL is the XML vernacular used for these messages, based on the two parts, firstly DDL or an object definition language, which describes and defines an instance of Analysis services and secondly, a command language which sends action commands like create ,modify or process to an instance of Analysis services. 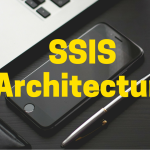 Client Architecture: SSAS consists of a thin client Component architecture. All the queries and calculations are solved by the server itself. So for every request a server to client connection is needed. There are many providers with SSAS to support the different programming languages. These providers interact using SOAP packets. 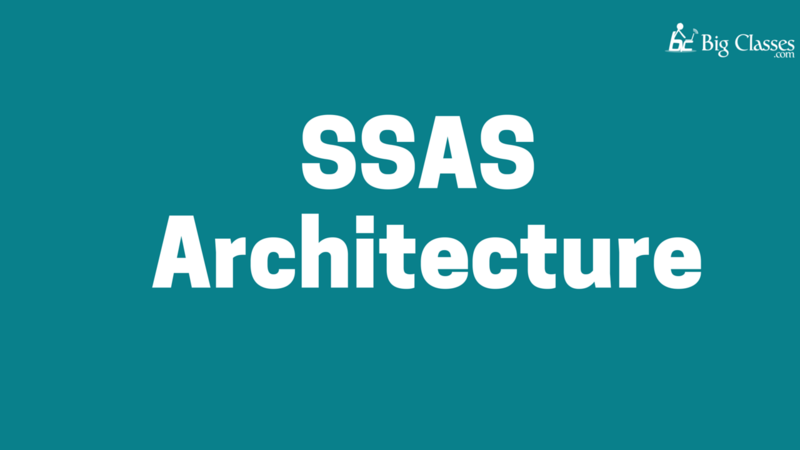 SSAS has web architecture too with a completely scalable middle tier to be installed by both the small and large organizations. It also offers a middle tier support for web services. Both the client and the server communicate without any provider. They communicate by sending XMLA in a SOAP packet. Easy to use with many wizards and designers. A flexible data model can be created and managed. Integrates with administration tools, data sources, security, caching reporting etc. Offers wide support for custom applications. Analysis service offers a combined view of the data in OLAP or Data mining. Services here are referred to OLAP, Data mining. Analysis services support creating, designing and managing multidimensional structures consisting data from different sources. It gives a wide range of data mining algorithms for particular trends and requirements.